【4k Ultra HD Action Camera & 170°Ultra Wide Lens 】: 4k Sports Action Camera records video footage in 4K/25fps, 2.7k/30fps, 1080p/60fps. 16MP image resolution & 170° super wide angle lens delivers skip-free crystal clear video and accurately capture every epic view and excited moment for you. You’ll be thrilled with it and found it’s much better than any normal cameras. ur life in a fantastic resolution and angle. 【30M WATERPROOF 】: Sports action camera equipped with IP68 waterproof case to protect the camera against water, sand and scratches. You could take videos or photos when you diving, supports diving depth up to 30m(98ft). 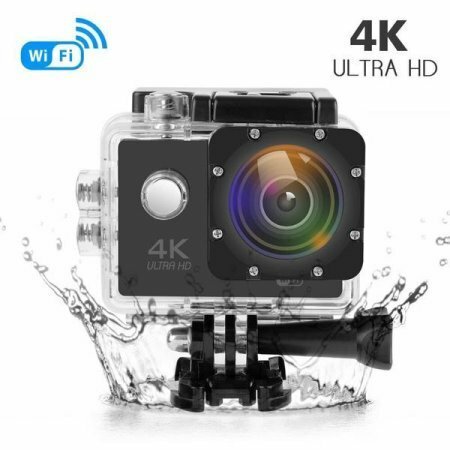 If you are a water sports enthusiast, this camera is a must for you, it will help you to capture every wonderful moments with high definition lens, Ideal for water sport, like surfing, diving , snorkeling, swimming, drifting and etc. 【Built-in Wi-Fi Sports Cam】: With Wi-Fi connected, the camera is completely under your control in “iSmart DV” APP. You can see what is displaying in camera without delay. Resolution setting, video recording, files deleting can be all realized. You are able to share your happiness to social medias. Sports action cam captures amazing moments and great memories with this digital camera. for water sports, like swimming, diving, surfing etc. Perfect for water sports lovers. 【Rechargeable Batteries and Multiple Free Accessories】: Come with Batteries for recording time and fun that of single battery; Unique handy and portable bags and other multiple mounting accessories provides a convenient capture solution for amazing perspectives. 【More Safe Guarantee with】30 days money back and 12-month warranty and professional after-sale service within 24 hours.